We are a team of qualified physiotherapists providing services to skillfully treat many conditions. These services include manual therapy, exercises prescription, education and pain modalities including acupuncture. BodyTech Physiotherapy also offers massage therapy and kinesiology services by a registered massage therapist and a registered kinesiologist. See below for more detailed descriptions or click here for a list of conditions treated. Physiotherapy is a health care profession which helps people to restore, maintain and maximize their strength, function, movement, and overall well-being through examination, evaluation, diagnosis and physical intervention. Physiotherapy includes rehabilitation, as well as prevention of injury, and promotion of health and fitness. Your physiotherapists will provide you with an individualized program to meet your specific goals. Your treatment may consist of hands-on manual therapy, pain relieving modalities (Transcutaneous Electrical Nerve Stimulation (TENS), Ultrasound, Heat/cold packs, Acupuncture), postural or corrective taping, specific exercises and education. We believe in educating our clients to complement their understanding and therefore response to treatment and aid in injury prevention. Our approach is based on active participation; therefore exercise will be an important part of all treatments. Both strength and flexibility are essential for joint stability and postural alignment. In addition, your physiotherapist will provide you with a preventative exercise program for you to continue beyond your treatment. Sports physiotherapy is an area of physiotherapy that deals with the prevention, assessment and management of sports injuries and other issues related to physical activity. Services are available to people of all ages involved in sports at any level. Your physiotherapist will help you with a sport specific treatment program to maximize your recovery, aid in safe return to sport and prevent injury reoccurrence. For safe and quick recovery and return to sport it is important to seek care if symptoms persist for more than 3-5 days. Pain and dysfunction for longer than this period of time may result in compensatory patterns resulting in delayed recovery and future injury. Our primary acute care focus is on pain relief, however pain resolution does not indicate complete recovery. At BodyTech Physiotherapy we focus on a complete approach which also includes flexibility, strength and restoration of sport specific function. This approach ensures gradual and safe return to sport. Concussion is a mild traumatic brain injury, which can be caused by impact to the head, face, neck, shoulder or elsewhere in the body, or by a sudden stopping movement. This can occur during sports injuries, motor vehicle accidents, or falls. A concussion can occur with or without loss of consciousness. Symptoms of concussion vary greatly from person to person and may include, but are not limited to, headache, confusion, irritability, insomnia, dizziness and trouble concentrating. Concussion symptoms may appear right away or hours after the injury. Full recovery is possible for most people with proper diagnosis and management. Recovery can vary from days to weeks, but differs for all individuals. Physiotherapy can be a useful tool in the management and treatment of concussion symptoms. During your concussion assessment at BodyTech Physiotherapy, your symptoms, neck and eye movements, and balance will be examined. You will also be tested on your memory and learning skills, your ability to concentrate, speed of thinking and problem solving. Your physiotherapist will then develop and monitor an individualized return to activity plan, so that you can return to work or sports as safely as possible. A gradual progression of activity, as well as frequent monitoring, will ensure symptoms do not persist longer than necessary, or return once subsided. Additionally, your physiotherapist will be able to treat any concurrent injuries sustained during the concussion, and provide education on prevention of concussions in the future. Baseline concussion testing also available. Kinesiology is the study of human movement, using a combination of biomechanics, anatomy, physiology and neuroscience.Kinesiologists have the knowledge to work in a wide variety of settings, including private practice clinics, rehabilitation clinics, fitness centres and in workplace ergonomics. Treatment focuses on injury rehabilitation, prevention of injury and management of pain or chronic illness. A kinesiologist can assess your movement and strength, then create and progress a specific exercise plan that helps each patient to meet their functional goals. At BodyTech Physiotherapy, ourkinesiologist sees clients for one-on-one sessions,as needed, in conjunction with their physiotherapy sessions. This extra time is used to reinforce and practice proper exercise techniques, continue progressions in treatment and provide additional client education for optimal recovery and return to pre-injury levels. Kinesiology became a regulated health profession in Ontario in 2013. A Registered Kinesiologist (R.Kin) must successfully complete a 4-year Bachelor’s degree in the discipline, then write an entry-to-practice examination through the College of Kinesiologists of Ontario. Massage therapy consists primarily of hands-on manipulation of the soft tissues of the body, specifically, the superficial and deeper layers of muscle, connective tissue, tendons, ligaments and joints. Various techniques are used to enhance function, aid in the healing process and promote relaxation for the purpose of optimizing health. Massage therapy treatment has a therapeutic effect on the body and optimizes health and well-being by acting on the muscular, nervous and circulatory systems. Physical function can be developed, maintained and improved; and physical dysfunction, pain and the effects of stress can be relieved or prevented through the use of Massage Therapy. Today’s Massage Therapists use their knowledge of anatomy and physiology to combine traditional Swedish and modern Massage Therapy techniques with exercise and other therapies to treat their clients. Massage therapy is a regulated health profession in Ontario and is performed by a Registered Massage Therapist (RMT). A Registered Massage Therapist is an individual who has studied anatomy, physiology, pathology, physical assessment, neurology and treatments at a recognized educational institution; completed 2200 hours of training; successfully completed examinations from the College of Massage Therapists of Ontario (CMTO); and have been "registered" by the CMTO in accordance with the Regulated Health Professions Act and the Massage Therapy Act. Massage Therapists maintain their registration by participating in continuing education and a Quality Assurance Program that assists them in the maintenance of high professional standards and quality care of their clients. At BodyTech Physiotherapy, our physiotherapists use Western medical acupuncture, which is a modality involving the insertion of fine needles that is based on traditional Chinese acupuncture. The needles are inserted at specific points in the body and do not contain any drugs. They stimulate the natural release of your body’s pain killers and anti-inflammatories and promote healing. Acupuncture is mainly used to treat musculoskeletal pain, myofascial trigger point pain, nerve pain, swelling and post-operative pain. Acupuncture needles are solid, stainless steel, sterile one time use needles. The needles are very fine and flexible and do not have a cutting edge like a hypodermic needle allowing it to slide smoothly through the skin and underlying tissue without trauma. Most people feel a dull, achy sensation when the needle is in place. The needles are left in place for approximately 15-20 minutes. There are minimal risks with acupuncture, some mild bruising, light headedness and sweating may occur. If these symptoms occur your physiotherapist will promptly remove the needles and help decrease these symptoms. Cupping therapy is a technique using cups applied to the skin to treat an array of illnesses. Used for centuries, its popularity continues to grow as people seek alternative and natural methods for treatment. Cupping stimulates healing by pulling blood to the region being treated. It promotes new blood flow to the area and removes stagnant blood which causes an anti-inflammatory effect by encouraging the body to release white blood cells, platelets, fibroblasts and other healing substances. Cupping is an effective technique to stretch fascia and muscles by helping to separate the different layers of tissue. Cupping therapy uses cups, made of soft silicone and hard plastic, used to suction soft tissue, and it is this vacuum effect, or negative pressure, that provides a therapeutic result. Many types of cupping therapy have been developed over the years. At BodyTech Physiotherapy our massage therapist uses 2 different types of cupping techniques massage cupping and dry cupping. Massage cupping is usually done in a massage therapy treatment in which the cups are applied to the skin and moved around. Dry cupping is slightly different as the cups are applied to the skin and the affected body part is moved around to create a stretching effect. There are a lot of benefits to be gained from having a cupping massage. Overall it promotes general relaxation and improves circulation. More specifically it can reduce tone in the muscles, help to improve range of motion and aid in reducing fascial adhesions left behind by old injuries. Cupping can help with many conditions such as low back pain, fibromyalgia, whiplash and tendonitis. 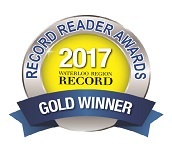 We are thrilled to announce that BodyTech Physiotherapy has again won GOLD in the Record Reader Awards for favourite Physiotherapy Clinic! Thank you Waterloo Region for all of your support and all of your votes! If you would like to book an appointment, please call 519.954.6000 or email info@BodyTechPhysio.ca with your name and number to have a member of our staff contact you about an appointment time. A division of Bodytech Physiotherapy. We would love to hear from you! Please fill out this form, email us at info@BodyTechPhysio.ca, or call at 519.954.6000. We will do our best to get back to you within one business day.